Over the past few years I've picked up a few Anni Hogan albums including Siberia where along with Itchy Ear they provided music to accompany imaginary lost scenes from films directed by the masters of European cinema and Music For Billy Chainsaw's Alphabill (A Love Story) where Anni collaborated with Martin Bowes to soundtrack an exhibition by the talented Brighton based artist. 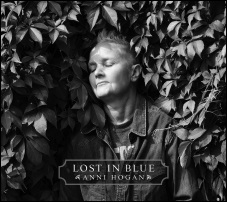 Surprisingly Lost In Blue is her first full vocal based release since Kickabye, an EP which featured vocals from Marc Almond and Nick Cave which first appeared way back in 1985 before being given the expanded treatment by Cold Spring in 2009. Anni Hogan is of course best known for her work with Marc Almond, initially as part of the Mambas and then with The Willing Sinners and La Magia, but on Lost In Blue she turns to Marc's partner in Soft Cell, Dave Ball who co-produced it with Riccardo Mulhall sprinkling magic over Anni's wonderful repertoire of songs. 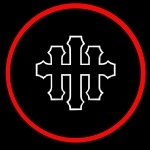 Aside from Anni Hogan, vocals on Lost In Blue are drawn from a cast of friends including Kid Congo Powers (The Gun Club, The Cramps, Nick Cave and the Bad Seeds), Lydia Lunch, Kraftwerk's Wolfgang Flür, former Virgin Prunes singer Gavin Friday and new acquaintances such as Richard Strange (Doctors of Madness) and John Fiddler (Medicine Head) as well as the writers Celine Hispiche and Scarlet West. Together they create a selection of modern day torch songs with a jazzy, downtown, late night vibe where vaudeville and cabaret are given a Lynchian and John Barry-esque twist, along with some other musical delights. Lost In Blue is just a beautiful and captivating listen. But before all that Lost In Blue opens to the folky hues of 'Lost Somewhere', draping Anni's plaintive yearnings over sustained viola droning before it swells with reverberating piano chords and whistles. Eerie and lulling with folk ambient wash it, like the final two tracks, seems drawn from another musical template to the majority of Lost In Blue. Centring around Anni Hogan's wondrous piano tracks the ensemble evoke a lush, smoky late night bar sound, rich in orchestrations and cinematic soundtrack stylings, to which the guest vocalists weave their lyrical magic in spoken voice or song. First-up is Kid Congo Powers who rasps and speaks, reflecting on his life on 'My Career', the piano, bass, saxophone and trumpet exuding a smoky late night cabaret world populated by a cast of seedy twilight characters of "outcasts, stoners, weirdos and the shy", bringing to mind a neat New York vibe accentuated with the Lou Reed-esque backing vocals. It gets more bluesy on 'Death Bed Diva' a swinging ensemble piece centred around Hogan's melodic piano filled with forlorn saxophone playing as Richard Strange wonderfully delivers this tale of faded glory, amidst some stunning compositional twists and turns on this tale of faded glory, augmented by a Midnight Cowboy soundtrack styled melodica. Soho was once a stomping ground for Marc Almond, and a continual reference point documented in Soft Cell's 'Seedy Films' and reflected upon on 'Soho So Long' a track from a much later solo album. Soho was also home to the Batcave club where Anni (before she dropped the E) DJ'ed. That street is referenced on 'Ghosts Of Soho', Anni's collaboration with the writer Celine Hispiche who looks back to the history and former habitué of the area. Above jazzy wafting sax, tinkering piano chords and brushed drums Celine Hispiche, in a thick London accent, evokes the spirit of seasoned drinkers such as Francis Bacon, Daniel Farson, Jeffrey Bernard who populated the drinking clubs of Soho. It lingers on London's centre of bohemia, whose heart has been torn apart by gentrification, its atmosphere ravaged in the name of progress. But as Hispiche cries at the end "this is my town, this is my home, don't take it away" it could be anywhere: London, New York or even Blackpool. Which takes us neatly to the twilight sound of 'Making Blackpool Rock' with its parped trumpet and brushed drum strokes, before it sweeps up into an exhilarating soul sound with the intoxicated, exhausted tones of writer Scarlet West, accompanied by some of the finest Northern spoken word since Maxine Peake fronted the Eccentronic Research Council. The spoken narration on 'Silk Paper' from Kraftwerk's Wolfgang Flür sounds sinister, as if voicing a vintage horror script set in a church but the music here, centred around Anni's piano score sounds classical, evocative and cinematic embellished by electronics and strings. Wolfgang Flür's other contribution, 'Golden Light', has been through a few revisions including an appearance on Scanni, Anni's collaboration with Scanner and on Wolfgang Flür's solo album Eloquence. This is by far the most captivating weaving a spirited trumpet score over Anni's melodic piano, as Wolfgang Flür narrates a warmhearted text about a lover's trip to Hastings. "It was love", he repeats as it bursts into rapturous, cinematic realms bathed in harp and sumptuous strings. Things start to get more downbeat on 'Blue Contempt' with the raw tortured spoken voice of Lydia Lunch strewn over moody piano notes. "Over and over I've begged you to just go away" she drawls in ravaged weary tones about a relationship set on self-destruct, as the music rises with Lynchian bass tones and evocative cinematic score. Anni's vocals appear sparingly throughout Lost In Blue but her forlorn tones light up 'Thunderstruck', providing an understated warmth, in lyrics evoking both 'Cry Me A River' and 'Gloomy Sunday' with a score involving muted trumpet and harmonica evoking John Barry circa Midnight Cowboy. I know now that the beautiful sadness captured within 'Thunderstruck' was Anni Hogan's immediate heartfelt response to the tragic death of MP Jo Cox, murdered by a misguided fuckwit. So tender and moving, it packs such an emotional punch you wonder why amidst all the guest contributions Anni didn't do more vocals. As enchanting as they are, it could be argued that the final two tracks with vocals from Gavin Friday and John Fiddler could have come from a different album. But I don't care, since Lost In Blue coincides with the release of Excess & Ruin, the latest album from Ginger Light (a brilliant collaboraton between the poet Jeremy Reed and Itchy Ear). That and the Lost In Blue track, 'Angels of Romance', only emphasises the fact that the former Virgin Prunes singer remains such a talent. Swathed in harp pickings, underpinned by an electronic rhythm, with beautifully evocative piano 'Angels Of Romance' features the earthy vocals of Gavin Friday, his voice rising from spoken tones to layered deliverances in this epic tale of love that is dramatic and uplifting steeped in lyrics veering from the humdrum ("the day is dark, the chips are down", "there's no tomorrow, just here today") to the spiritual, summoning the protection of angels in this grandiose electronic hymn to love. The world needs more love, just as it needs more Gavin Friday. The title track featuring the emotive voice of Medicine Head's John Fiddler is an end of night lament for the lonely, broken hearted and fallen, lost in a bluesy, gospel sound. It is conversely incongruous and almost fitting, bringing the album to an end with its hopeful lyrics captured with its harmonica laced sound, and is almost liberating when Fiddler, accompanied by a chorus of voices, requests we all "get high tonight on the edge of the sky tonight, another day here with you another day lost in blue". Following the release of Napoleonic Blues we present an English translation of an interview conducted by Sergio Volumen where Richard Leviathan expands on the history, mythology and philosophy that underpins his work as Ostara. 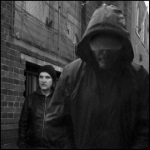 We catch up with industrial doom duo khost to talk about their albums Copper Lock Hell, Corrosive Shroud and Governance and the influences that make their sound so unique, as well as Godflesh, Birmingham, the evolution of khost and much besides. 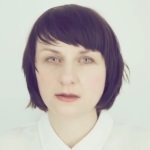 The Glasgow based Polish artist speaks about her art spanning soundtracks, opera and vintage electronics as well as her haunting ghost-pop releases Tumult In Clouds and Circles Of Upper And Lower Hell. The former Head of David singer, Stephen ĀH Burroughs expands on the influence of Gnosticism, Buddhism and mystic Christianity on the stunning post-industrial albums Lost Corridors and Thus Avici. Danny Hyde looks back on working with Coil, remixing Nine Inch Nails and his subsequent work with Peter Christopherson, in addition to his projects Aural Rage and Electric Sewer Age. Extensive review of Nikolas Schreck's The Manson File: Myth And Reality of An Outlaw Shaman, summing up 25 years research into the Charles Manson phenomenon. If you thought you knew the true story of the Manson murders or thought you knew Charles Manson, Nikolas Schreck will make you think again.